If asked what would I like more of in life, one of my top answers would be time. However we all know that time is finite and there are only 24 hours in each day. With all of our commitments to work, school, family and a long list of other daily chores, it’s tough enough to get the time you’d like to practice and race let alone train in the gym to be in great shape as you pursue more and more speed. I’m going to introduce you to a training technique that can not only completely change your strength and stamina, but you can do it all in less than 30 minutes – that training technique is called High Intensity Interval Resistance Training (HIIRT). Traditional Training Group— This group performed four sets of eight different weight-lifting exercises where they would reach muscular failure between 8 and 12 repetitions in each set. 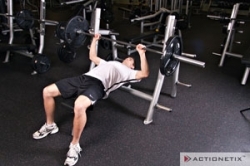 High-Intensity Interval Resistance Training Group (HIIRT)—This group performed three different multi-joint exercises (leg press, bench press, and lat pull-down) with the following routine for each exercise: The athlete would compete six reps of an exercise and then rest for 20 seconds; complete a second set with the same weight for two to three repetitions, they would then rest for another 20 seconds; then complete a third set with the same weight for another two to three repetitions. This was done for two more series and was replicated for the three different exercises (leg press, bench press and lat pull-down). The researchers then measured resting metabolic rate (how many calories your body burns at rest) before any resistance training and then again 22 hours after resistance exercise on the following morning. The traditional weight-training routine took about an hour to complete while the HIIRT routine lasted about 30 minutes. Also, the total volume of work completed in the HIIRT group was significantly less than (~50%) the volume of work completed in the traditional training group (getting the drift here – shorter time training, less work and as you’ll see greater benefits). Even though the HIIRT group only trained for 30 minutes at a time and did a lower amount of total work (reps and weight) , the HIRT group significantly elevated resting metabolic rate by approximately 24 percent in comparison with the traditional resistance-training group increase of approximately 5%. When you elevate your resting metabolic rate, you are burning more calories and in this study a large percentage of those additional calories were from fat. Try the following routines 2-4 times per week while in race season (they only take 30 minutes each) to keep your metabolism high, strength elevated and cardio supported. There’s really no excuse now for being in shape. Note: for safety reasons, it is important to warm up appropriately before raising your intensity for these workouts. Of course I always recommend some focused core work that strengthens the abdominals and lower back, but my point with this type of training is to show you how to be tight on time, but big on results. If you are interested in learning how to do the exercises listed above, just go to ACTIONETIX.com and click on the Training link on the main menu. Also Like our Facebook page (Facebook.com/ACTIONETIX) to stay up to speed on the latest info from us including new articles, product discounts and other great information, our email us with any questions at info@action-brands.com.